This entry was posted on Tuesday, September 11th, 2018 at 12:19 pm. WESTBURY Junior School had cause for a double celebration this month, with its 60th birthday and the news that it has maintained its ‘Good’ Ofsted rating. To mark the milestone event and the result of the recent inspection, Westbury Juniors hosted a celebratory assembly at the school last week. Guest of honour was former pupil Charlie Gardiner, who started school on its opening day in 1958. He was given the chance to blow out the candles on the cake, made by the kitchen staff at the school. Headteacher, Richard Hatt, also invited the current youngest member of the school to join Charlie, year three student, Charlie Hucknall, who also happens to be Charlie Gardiner’s great-niece! They were joined by pupil, Finlay Brooks, who also had the honour of blowing out the candles as he was celebrating his birthday. 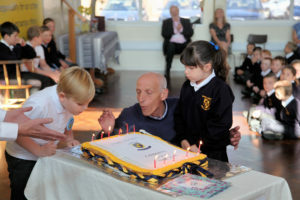 Headteacher Richard Hatt said, “ Westbury Junior School has reached the ripe old age of 60 on the Oldfield Park estate. The school at present is very fit and healthy, with results for last year across the board being above the national average. “In June, the school had another Ofsted inspection that confirmed that the judgement of ‘Good’ had been maintained from 2015 and the school had continued to improve. “It also commented that ‘there is an effective team of teachers and leaders who have given pupils the balance of stability and challenge to raise standards’. Chair of governors for Westbury Junior School, Ian Cunningham added, “The governing body are delighted with the recent performance of the school in so many areas and thank the staff and pupils for all their hard work.